This volume in the popular series of the Ignatius Catholic Study Bible covers the three letters of St. John and the Book of Revelation (or Apocalypse). The three Johannine letters are explored first, with ample notes and reflections representing the best of contemporary and traditional scholarship and commentary. The largest portion of this volume is devoted to the Revelation to John, also called the Book of Revelation and the Apocalypse (from the Greek, meaning "unveiling"). Written in highly symbolic style, the Revelation to John is perhaps the most difficult book of the Bible to understand. Scholars have long debated whether the book is concerned mainly with a symbolic depiction of the struggle of good against evil or whether it applies to specific events in history-its own time, the general course of Church history, or the end of the world. The annotations and commentary on this volume draw on the best elements from each approach, while emphasizing the biblical author's immediate intention: to recount the heavenly vision he received as it applied to his own time. Modern scholarship, as well as insights from the Church Fathers and other classic commentators, help the reader make sense of what many people regard as a confusing book. The Ignatius Catholic Study Bible includes Topical Essays, Word Studies and Charts. Each page features an easy-to-use Cross-Reference Section. Study Questions are provided for each biblical book, which can be used for personal or group study of the Word of God. Each biblical book includes an introductory essay covering questions of authorship, date, destination, structure and themes. Also included are outlines of each book. The text of the Ignatius Catholic Study Bible is the Revised Standard Version, Second Catholic Edition. 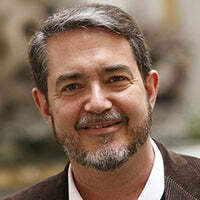 Scott W. Hahn is an American Roman Catholic lay theologian, contemporary author, professor, and Christian apologist. A former Presbyterian who converted to Catholicism, Hahn's popular works include Rome Sweet Home and The Lamb's Supper: The Mass as Heaven on Earth. His lectures have been featured in multiple audio distributions through Lighthouse Catholic Media. Hahn is known for his notable research on early Christianity during the Apostolic Age and various theoretical works concerning the early Church fathers. Hahn presently teaches at the Franciscan University of Steubenville, a Catholic university in the United States. Hahn is married to Kimberly Hahn, who co-runs their Catholic apostolate, the Saint Paul Center for Biblical Theology.